Article 6 of the Animal Protection Society of Dubrovnik (APSD) Statute: “The role of the APSD is to prevent the abuse and inhuman treatment of animals and to raise people’s consciousness about a more compassionate attitude toward animals”. It is 15 November 2015. After 15 years of hard, humanitarian and voluntary work, and in spite of numerous promises from the City of Dubrovnik to build a shelter for abandoned animals, we are standing on the top of Žarkovica Hill (the place which, instead of becoming a tourist attraction, is still a home for abandoned animals because of the administration’s demonstration of power). We are tired, disappointed and furious, but also determined to protect animals which are being punished, abandoned and ill-treated by our fellow-citizens who escape punishment because the institutions fail to do their jobs. The actions that have been taken in recent months by Andro Vlahušić, Mayor of Dubrovnik, and Vedran Kunica, Director of Sanitat LLC, reveal that the intentions of this City are dishonourable, illegal and inhuman. Since we had been taught to see in the first place good and positive things in people, we have believed their promises and firm handshake. Unfortunately, we have been cheated by the people who have „held us in their power“ by emotional blackmail, bringing us to the brink of physical, emotional and financial disaster, and who have ignored the laws of our country in the process. Thus, we say determinedly „ENOUGH OF THAT! WE FEAR NEITHER YOU NOR THE RETALIATION YOU HAVE ANNOUNCED“. Director of Sanitat LLC announced in the media that, if a new shelter was built, he would forbid volunteers to enter it – which is illegal and scandalous, to say the least. Why refuse entry to anyone if everything will be in accordance with law, humane and transparent? 1.THE CONSTRUCTION OF A SHELTER IN AN ADEQUATE LOCATION WITH A CAPACITY SUFFICIENT FOR 350 DOGS AND 200 CATS, WHICH WILL BE CO-FINANCED BY THE NEIGHBOURING MUNICIPALITIES WILLING TO DO IT (Next week, another location will be proposed to the Mayor so he will not have an excuse for building a shelter with an insufficient capacity in the Žarkovica location). 3.MR. KUNICA'S WITHDRAWAL from all activities in connection with looking after neglected animals, and the appointment of a person who would carry out the said activities in a professional and humane way. 4.TAKING OVER THE PROVIDING FOR the neglected animals from Žarkovica and cat feeding stations (workers, food, reparation of animal quarters, sterilization, medical treatment, etc. ), until the construction of a shelter in a new location. 5.THE INVOLVEMENT OF THE ANIMAL PROTECTION SOCIETY (the volunteer society which has been looking after neglected animals for 15 years now) in all activities of the future shelter in connection with the providing for neglected animals. The Animal Protection Society of Dubrovnik (APSD) was established in 2001, aiming to close the infamous dog pound in the Village of Mišići, where dogs lived in the most difficult conditions, and where, after 30 days, the (surviving) ones were killed by illegal means. After Mrs. Dubravka Šuica, the former Mayor of Dubrovnik, had closed the dog pound, and with her support, we managed to open Dubrovnik's first and only animal shelter on Žarkovica Hill. Animals got a safe and warm place, as well as a temporary station until their adoption. Our fellow citizens got the safety they lacked for many years, because packs of starving and sick dogs and cats used to wander our streets. That same year, the City of Dubrovnik gave its first promise to build a city shelter for neglected animals! After 15 years, nothing has changed! If our City Mayor thinks that volunteers have to take care of communal problems, he better abolish all of the existing communal companies in Town, i.e. Čistoća, Vrtlar, Boninovo: there are surely people who would rather work on a voluntary basis. That way the Town would save important financial means, which could be then invested in crucial projects, like it was the case last year (???). Just for information, the Town Company Sanitat LLD is responsible for the care of abandoned animals. Although its employees enjoy excellent salaries, all they eventually do, in case they are in the office, is to give the telephone number of the Association if there is a reported problem to be solved, such as taking care of a wounded, abandoned or abused animal. YES! Exactly... love and respect of all living creatures, to include animals – is our choice. But our choice also goes for a decent City Government and a City Mayor respectful of applicable laws of this country, obliging him, in our case, to establish an adequate shelter for abandoned animals. NO! We don’t trust the City Mayor and the Director of Sanitat LLD Mr. Kunica. They both showed their real faces during the last two months while taking illegal, dishonest and inhuman actions to “save” our animals. Luckily, they were stopped in their intentions thanks to volunteers, citizens, numerous associations, Homeland War defenders, good people and supporters from the country and abroad. While the Animal Protection Society has been expecting the construction of an animal shelter (the funds were repeatedly assured year after year within the Budget, to be afterward redirected for something else), the Town of Dubrovnik, in the meantime, signed a contract and an annex to the contract (unavailable to the public, being supposedly proclaimed as a business secret!) with a shelter located in Kašteli – 200 km away, that should provide 30 places for the Dubrovnik dogs. In the event of which, the Town would pay 2.500,00 Kuna per dog, in addition to transportation costs, which means a total of 800.000,00 Kuna at once and without really solving the problem. Other dogs would be, according to the City Major’s words, bestowed to different shelters around the country. We consider it a “Mission Impossible”, knowing there are no available places anywhere. What would then happen to other dogs? Has the City Mayor planned, together with the Director of Sanitat LLD, to put them asleep, like he had planned in 2009, when such intentions were stopped thanks to protestations and actions of animal lovers from all around the world? The Town Authorities explain such a relocation plan by the Decision of the Veterinary Inspection from 2015, ordering the Town of Dubrovnik to find a way to secure abandoned animals. We would like to point out the Town had received the same orders in 2009 and in 2012, but ignored them both times. Why is it that this time the Town sticks strictly to the Law? Is it because of the construction of a golf course? Or, maybe someone has got his eye on the attractive area of Žarkovica and things have to be arranged hurriedly? Whatever the reason, it is unacceptable that the richest town in Croatia, with the budget of around 400 million Kuna, makes such a decision instead of building a dog shelter worth 1.7 million Kuna as planned. It didn’t take long for the DMV, Filipović, from the dog shelter in Kašteli, to come, without notice or orders, supposedly with the approval of Sanitat LLD., to Žarkovica early one morning, and to stun fourteen dogs from the first boxes of the shelter with Sedalin, while the volunteers were busy working in its upper part, before taking them away. The case was reported and filed to the State Attorney upon criminal investigation. Unfortunately, our dogs haven’t been sent back, which is one more indicator everything is possible in our country. Needless to say that the later statements of the Town’s leading people in relation to animal care, vary from the City Major’s on the construction of a shelter of an unknown capacity in the near future, to the one of his Deputy on the construction of a shelter for about one hundred dogs and an unknown number of cats, starting next week (the remaining animals would be transported to the shelter in Kaštela, of the capacity of 30 dogs ??? ), and finally the statement of the Director of Sanitat LLD, saying the construction of a shelter accommodating 50 dogs would start in a year (it is, by the way, incredible that the young Director of Sanitat believes only 6 female dogs from all thirty-one settlements of the Dubrovnik area would give birth in the next year). We are currently taking care of 319 dogs, and feed around 200 cats (we regularly file reports to the competent authorities on the number of animals, which has been in recession year after year, and indicates how efficient is the action of sterilization, and adoption and education of the citizens on quality care of their pets). We would like to note that the animals are healthy, well fed and sterilized up to 80%, as regularly verified and stated by the Veterinary Inspection since 2007, and also confirmed at the last monitoring performed by a team from Split. From the total number of dogs, 211 come from the area of Dubrovnik (stretching from Trsteno to Dubac), and 108 from other neighbouring municipalities (mostly from Primorje, Župa and Konavle). We must admit there is a considerable growing interest for animal care among the regional population (the total of 122.000 people), although we are still considered “animal haters” in the world media, occupying the seventh infamous place for atrocities committed against animals, such as poisoning, staking (the images from Babin Kuk travelled around the world) and many other horrors. As for the dogs from the surrounding municipalities, our City Mayor complained on several occasions about paying money for them. The truth of the matter is that most animals are adopted into those municipalities. Besides, several local mayors expressed their wish to co-finance the animal care per head if they had necessary funds, the amounts paid on their accounts for that purpose by the Town of Dubrovnik being shockingly short. Also, they we never again invited for further negotiations! So much about reducing and splitting the costs... It is always easier to blame others for one’s own failures. Generally speaking, it is usual that regional centres initiate changes in resolving such issues as ours and it would not be realistic to expect small municipalities to build shelters before Dubrovnik does it first (By the way, Korčula and Ploče have small shelters). We have been investing our own means and efforts for fifteen years now, backed by volunteers, veterinarians and lots of people from around the world, in order to assure a dry shelter during winter, sun protection in summer time, veterinarian care (including sterilization, vaccination, chipping, anti-parasite treatments, in particular the protection against Lischmaniosis – 4 times during summer, spraying the whole area against mosquitoes), let alone 24-hour daily voluntary work, including field work too. 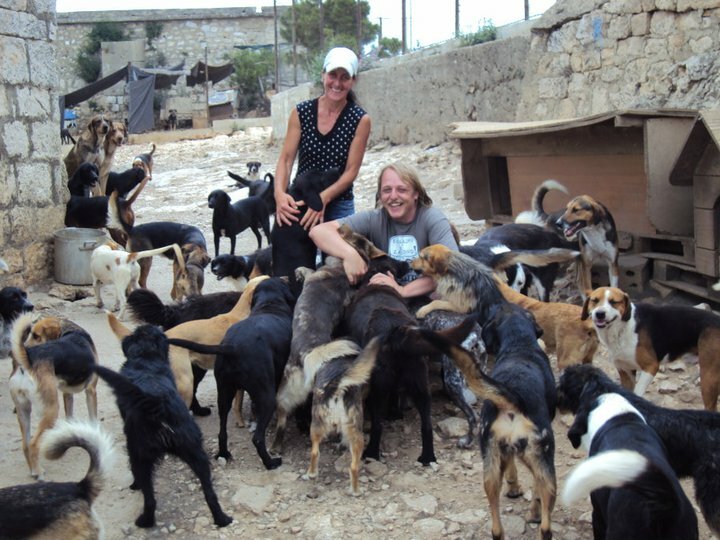 In the last years, the Town of Dubrovnik has been providing food for dogs only, and thus on an irregular basis. It also paid for dog vaccination twice in fifteen years. The Town had also employed a number of persons to perform different jobs in the shelter, for the period of three months, but the majority gave up due to extremely hard work conditions. The Association has been covering the food cost every time the Town would miss to deliver it. The Association also covers cat food, treatments for sick or wounded animals, refurbishment works on the shelter... Volunteers build animals sheds themselves, buy necessary materials such as nylon, nets, and tools; we also pay off transportation costs (fuel) and workers engaged for professional works. There is no electricity in the shelter. Water is delivered by Fire-fighters and stored in built-in and plastic tanks we purchased at our own expense. Solid faeces and trash are collected by the Company Čistoća once a week. Nobody is employed in the shelter. The entire work is performed by volunteers, mostly women, outdoors at all seasons, lacking rest premises, running water, electricity, WC (we use dog containers at night). The volunteers of the Mountain Rescue Service participate in the actions of animal rescue from crevices and greater heights, while the Association of German Shepherds Breeders and the Kinesiological Association Libertas Dubrovnik help with education and training of dogs. DVM Emilio Menđušić from the Falconry Centre in Šibenik provides us with selfless and free help in the treatment of wounded birds. It is very hard to present the public with a truthful image of the abandoned animal shelter at Žarkovica and with a fifteen-year long work of our team, that is sincerely and wholeheartedly performing hard work, important not only for animals and animal lovers, but also for the Town that depends on tourism, as well as for all the citizens who can now relax not seeing starved and sick animals wondering around. Herein, please find the statistics data (all documentation is available at the following instances: the Town of Dubrovnik, the Accountant Service “ISAR”, “FINA” (we regularly file our annual Balance Sheet and Financial Report in the quality of a non-profitable organization), as well as at the veterinary cabinets “Bobanović-Ćolić” and “Anima Vita”, and also in the records of Mrs Ljiljana Cvjetović, lawyer and volunteer. The above documentation is herein enclosed). 2015 – 51 dogs, 78 cats sterilized until October of 2015. In 2015, the Town of Dubrovnik delivered dog food in the amount of 311.057,23 Kuna, paid to the firm “Alca”. Zero Kuna was paid on the account of the Animal Protection Society by the Town or any other town institution. We don’t claim gratitude or reimbursement of the money invested (although it would be easy to sum up what the Town would have spent if the City Major had by chance decided to respect applicable laws of this country, taking in this case proper care of abandoned animals) and for all we did (built boxes and sheds, vaccinated, chipped and sterilized our animals, treated them against ectoparasites, put asleep the deadly ill ones for now thirteen years and throughout that period collected abandoned ones, bought equipments, tools, sacks, paid out fuel and construction and renovation work of the damaged parts of the shelter, as well as workers on a 24 hour basis daily (just to remind that the Town has an obligation to employ one worker per 20 animals). It is, of course, easier to leave everything to others and feign a benefactor by presenting the public with the amounts spent on dog food, prolonging our agony. We submitted over 200 reports of violation, abandonment and other breaches of the Law on Animal Rights to competent authorities, as well as 26 reports in order to penalize those of our citizens who upset other citizens by the way they treat their pets. Nobody, of course, by “good old Croatian custom” was penalized, 3 cases still being in procedure (???). The job of volunteers doesn’t end at Žarkovica compound and feeding places: we receive numerous daily calls from both our citizens and different institutions, expecting us to take immediate action whatever the cause might be: road-killed animals to be collected, wounded, lost or abandoned animals to be secured. They often don’t realize we are only volunteers and not Supermen, and therefore need time for an action to be done. We are often exposed to all kinds of threats and even physical violence or other misfortunes while doing our duties (like throwing poison in the boxes at night, receiving threats of hunters, given the hunting ground is meters away from the shelter, running a risk of unexploded mines left behind the war within the shelter, coping with animals left around the shelter, not to mention a fire that had completely devastated the shelter). Unselfish love of animals is our choice and, therefore, we care about them every day, 24 for hours a day, 365 days a year. Unfortunately, we are not omnipotent. In addition to the above described activities, we also work on adoption of the animals, promotion of a quality co-habitation between man and animals and proper care of animals, education on walking the dogs leashed and collecting the faeces, promotion of vegetarianism and veganism, advocacy against animal torture in labs and for the purposes of the fur industry. We also report non-conscientious citizens to competent institutions, we educate children at schools, organize exhibitions, conferences, humanitarian concerts and other events in order to raise public awareness for such less visible topics and to incite change of social consciousness. It is useless to talk about disinterested institutions: their arrogance makes them think that a group of citizens, who solved a huge “communal problem” for them, will anyway continue to work endlessly instead of them. Luckily, there are so many nice stories: thousands of saved animals, praiseworthy adoptions, wonderful people who touch us over again and again, plentiful of sincere love, gorgeous animals that have made our lives worthier. In the end, here is a story that should have had a happy ending, but unfortunately and symptomatically for Dubrovnik, didn’t. A respectful medical doctor from Italy, originating from Dubrovnik, contacted the City Mayor through her attorney team in Zagreb, offering a win-win deal: she was ready to invest her own assets for the construction of an animal shelter on a plot that once belonged to her family and is now a matter of dispute. She is namely claiming it back from the Town of Dubrovnik that has been inscribed as its owner since its confiscation by the State. Her only requirement was the Town withdraws the appeal contesting the restitution of the nationalized property she stood for. Given the procedure before the Administrative Court was in course for a longer time, and the restitution certain (which happened in the meantime), the idea was to get involved the City’s attorneys in order to verify the lady’s allegations and to accelerate the procedure, with, as a result, a win-win situation, both for the lady, aged 80 at the time, and for the City in realizing their respective interests: Dubrovnik would have a shelter, and the Lady her confiscated property. Useless to say, her proposal was rejected... because a tourist champion and the biggest tourist destination, the fourth most beautiful town in Europe, the sixth on the list of desirable towns to live, one of ten must see towns and the third most romantic place, displaying with millions on its account, cannot allow somebody else to build an animal shelter. Why anyway, when it is much easier and cheaper that the volunteers from the hilltop above Dubrovnik, where nobody can see them, work and keep quiet for the “beloved leader”. We, therefore, suggest the authorities include a visit of Žarkovica in Dubrovnik Card as well, in addition to other places of interest, so that tourists can also get an idea of the other side of one of the most beautiful towns in the world: hiding its inhumanity on the slopes of Mount Žarkovica, but not only and exclusively there. We are also aware those sitting in “comfortable armchairs” cannot imagine what it is like to work on top of hill under rain, thunder, heat and other bad weather conditions, without shelter for 15 years, incapable of insuring a minimum for animals by investing the maximum in every way; however, that doesn’t justify their attitudes and absence of responsibilities in regard to applicable laws and their salaries. We can now say, with clear conscience and supported by numerous animal lovers and associations from Croatia and the world: IT IS ENOUGH! Enough of exploitation, false promises, manipulations, emotional abuse and humiliation! We are starting a new battle for the salvation of animals, endangered because of arrogance, arbitrariness and violation of the Law of this town government. We won the battle for a ban of euthanasia of healthy animals in 2009, and other towns around the country followed our example by adopting the same Decision, and we have no doubts we will win this battle too!